But now, let’s move onto pizza! 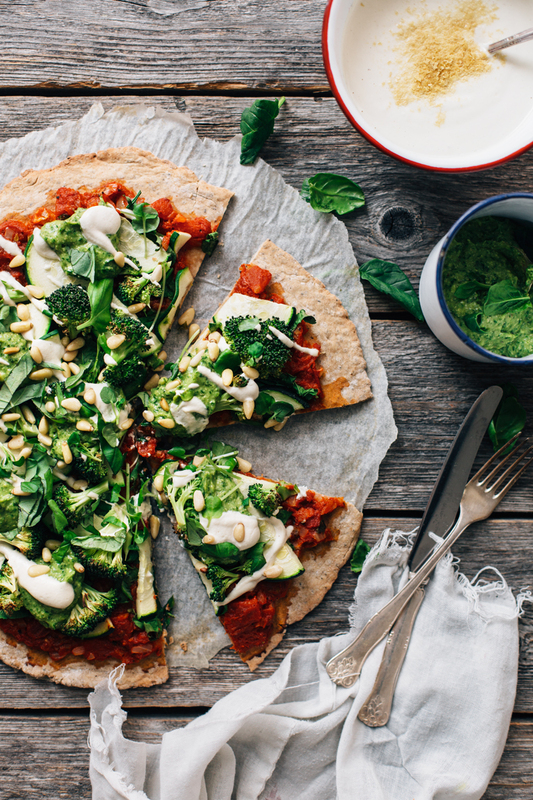 This pizza right here ain’t an ordinary one, but a vegan and gluten-free chia pizza made with true love. Besides the crunchy crust, it has homemade tomato sauce, fresh vegetables, cashew cheese, and avocado pesto. I really think I went to heaven while eating this. Or then I just really love pizza. It takes a little longer to make this pizza than my usual recipes, but I guarantee you that it’s totally worth it to spend a bit more on time on this. And the recipe is very simple, trust me. The longer you let the tomato sauce to simmer, the better it will be, but if you’re short on time, you can use a store-bought version too. I recommend trying out the cashew cheese and avocado pesto though, as they really bring a great flavor. And if you’re not into zucchini or broccoli, you can always switch them to other veggies or toppings you like! 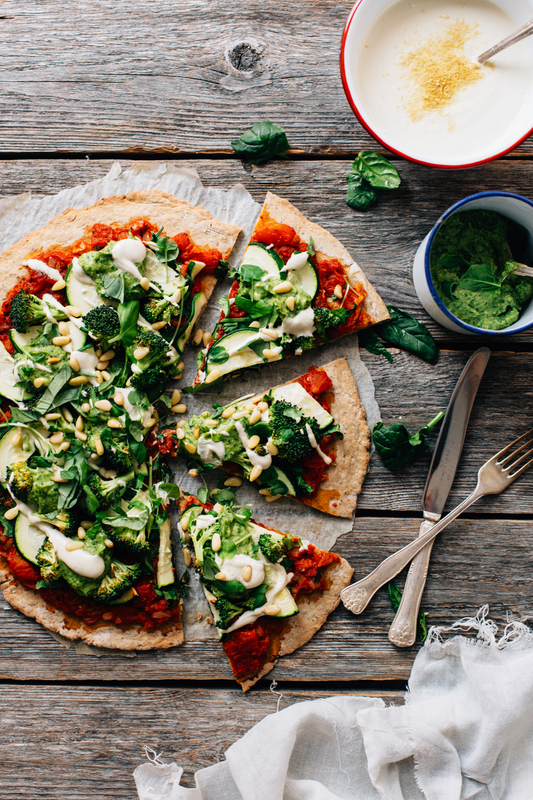 notes: if you’re short on time, you can replace the homemade tomato sauce with a store-bought version, and instead the avocado pesto just slice some fresh avocado on top of the pizza. 1. Start by preparing the tomato sauce. The longer you can let it to simmer, the better it will be. I recommend preparing the cashew cheese and avocado pesto beforehand as well, so that they’re ready once the pizza comes out of the oven. The recipes are below. 2. Preheat the oven to 225 C / 425 F degrees. Cover a baking sheet with baking paper and set aside. In a small bowl, mix the chia seeds with water and let thicken for 5 minutes. In another bowl, mix the buckwheat flour, baking powder, and salt. 3. Mix the olive oil to the chia gel and then add the chia mixture along with the water to the dry ingredients. Knead the dough by hand until it’s easily moldable. Form one large or two smaller pizzas from the dough and bake in the oven for about 10 minutes, until the crust is slightly golden brown. 4. Cut ​​the zucchini and broccoli into thin slices, and rinse the spinach if needed. Once the crust is pre-baked, start by adding the tomato sauce and then layer the vegetables on top evenly. 5. Return the pizza to the oven and bake for about 8 to 10 minutes, or until the edges are beginning to brown and the vegetables are slightly softened. 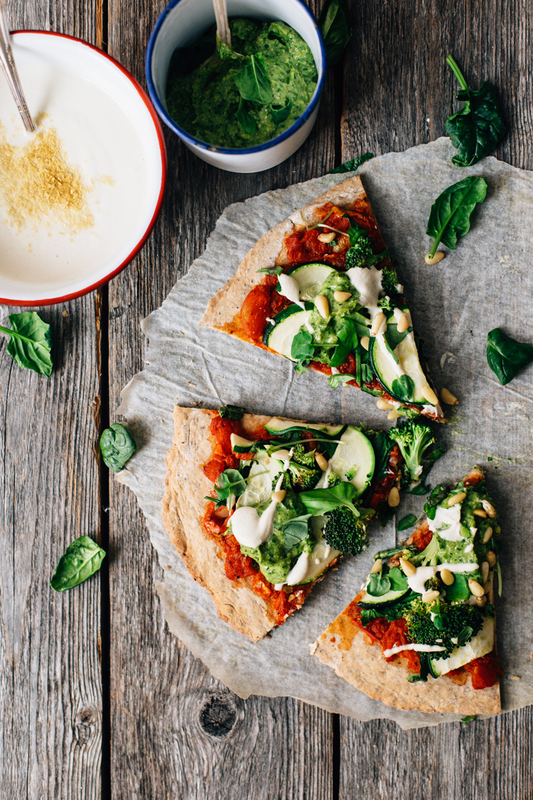 Take the pizza from the oven and finish with cashew cheese and avocado pesto. Serve warm, and enjoy! Cut the onion and the garlic to small pieces. Heat a frying pan, add the olive oil and sauté the onions until they soften. Add the crushed tomatoes, oregano, salt and pepper, bring to a boil and let simmer on low heat for about 15 to 20 minutes. Add the fresh basil just before taking the sauce of the heat. Taste, and add spices if needed. If possible, soak the cashews in plenty of water for at least 4 hours, or overnight. Rinse and drain. Add all ingredients to a blender and blend until creamy and smooth. Begin with a small amount of water and add as needed, depending on the consistency you’d like to have. Store the ‘cheese’ in an airtight container in the fridge. Scoop the avocados to a blender. Add all the remaining ingredients and pulse until smooth. You can use a hand mixer too to make the pesto. Taste and add more salt / pepper / lemon juice, if needed. Store the pesto in the fridge. Tagged lunch & dinner, pizza, vegan, vegetables, vegetarian. BIG NEWS: I'm launching a Meal Plan Service + a giveaway! My new project is here! I'm launching a Meal Plan Service called Vegmeals and it will make your life easier, greener, and a lot more delicious! Thank you so much, my taste buds were absolutely blown by how the crispiness of the base, the creaminess of the avocado and the flavours of the cashew cheese all complemented each other so well. An excellent dinner! The only changes I made were to use a carrot instead of the zucchini and baby chard instead of spinach. I had ran out of nutritional yeast so could not use it, but found it to be flavourful and umami-rich even without. Thanks again! Even my brother who despises broccoli happily ate it all. Love this pizza Tuulia, especially that crust – you are genius! Will have to give it a try here soon with some fall toppings. Hope you are staying cozy and enjoying your fall in Finland friend, always love seeing a glimpse into your magical life up north – xo.